First Steps | Parents & Sitters. Connected. a sitter is the only step. Welcome to First Steps Atlanta! We’re thrilled you have heard about our network and invite you to explore the website to learn more about our growing community connecting top-notch Atlanta parents and sitters. We are constantly looking to add new, qualified members. If you think First Steps is a good fit for you, please go ahead and begin your application online. "Every sitter I've gotten has been prompt, professional and trustworthy..."
"I can't tell you how happy I am I found you! ...I know I can trust you." "We've used a couple sitters and felt comfortable with each of them." "First Steps has changed the way we find and hire babysitters." "I no longer worry about making plans because of babysitter availability." "First Steps was recommended by friends and we've used it ever since." "The Founder does a fantastic job pairing sitters and parents!" "It takes all my fears away from having a first time sitter." "We've always found a sitter, even on short notice ..."
"First Steps has provided our family with high-quality and capable caregivers..."
"I never hesitate to leave my newborn with anyone from First Steps." "It is so easy. Now I can hire a sitter for date night with just one email!" "Thank goodness for Quinn Fordham and First Steps!" "She always finds us a fantastic sitter who I trust with my girls." 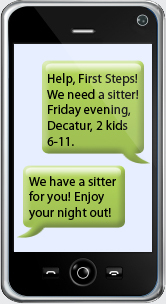 The First Steps model eliminates the phone tag and hard work for members. Parents no longer play the waiting game and sitters pick and choose the jobs that best suit them. Requests are reached by hundreds of sitters with just one click and direct contact information of the matched sitter is provided almost instantly. Each First Steps member – parents and sitters alike – goes through a multi-level application process to ensure the best fit for everyone. Most importantly, potential members meet face-to-face with a First Steps representative. All families have a home visit while sitters have an interview. Why? Technology is great, but there are just some things people will always do better – especially when it comes to the care of children. Our sitters are better. Each sitter is college educated and otherwise professional. We seek individuals who love children, have good experience and are looking to supplement their income during free time. Our sitters have regular 9-5’s, flexible positions or are currently in transition. Has the economy caused some changes in your life? Join First Steps to sit in the meantime and meet other area professionals while you look for something new. First Steps is more affordable too. Parents, pay just once per year to be a member of First Steps. Join for a first year enrollment fee of $199.99 – ($99.99 annually thereafter, auto-billed) – with no additional placement fees or hidden costs. Use First Steps as much or as little as you’d like, and build your own relationships, with zero additional transactions. Sitters, join First Steps for a one-time fee of just $39.99 to cover the cost of your background check ($19.99 annually thereafter, auto-billed) and you, too, may use it as much or as little as you’d like.